It is an offensive shot executed from the rear court. It travels downwards to your opponent’s side. 1. Get into position and adopt the Forehand Grip. If you intend to hit the smash, you should move quickly towards the shuttle. In professional badminton, we call this ‘injection of pace’. Ideally, your body should face the side of the court. Both your feet should also point sideways. 2. Stand on a firm position. If you’re not on good balance, your smash won’t be strong because your body will concentrate on balancing first rather than doing a strong swing. 3. Raise your Racket Arm and Non-Racket Arm. Make sure you stretch your racket arm as far back as possible. This will help ensure you perform a full arm swing. At the same time, raise your Non-Racket Arm to balance out the weight of your Racket Arm. This is VERY IMPORTANT to help you maintain body balance. This creates a steep angle for your smash. 5. Hit the Shuttle with a Full Arm Swing. Take a deep breath. Stretch out your chest to the widest extend possible. Stretch out your Non-Racket Arm. Then swing your racket forward as you exhale. At the same time, contract your abs. Shuffle your Racket Foot to the front. 6. Follow Through with your Swing. After you hit the shuttle, follow through and complete your swing. Your body should face forward after you swing your racket. Maintain body balance and recover. Swing your racket forward as hard as you can and there you go… A Smash! Knowing how to smash doesn’t make you a pro. Smashing with the right technique is the key to bring your badminton skills to the next level. Smashing hard doesn’t win you points. But smashing smart does! On this page, you’ll learn how to execute the smash smartly and correctly. Perfect your Overhead Forehand Stroke: In order to produce quality smashes, you’ll need to get your Overhead Forehand Stroke right. Perfect Your Technique for Smashing: Good technique is super important when doing the badminton smash. When you begin to train your smash, try to do soft badminton smashes first to familiarize yourself with the correct technique. It’s VERY important that you do not start off using your full strength. Your focus will be diverted to doing strong swings and balancing rather than executing the correct technique. Loosen up your body. You won’t get the technique right if your body is too tensed. Relax your muscles. Do not grip your racket too tightly. 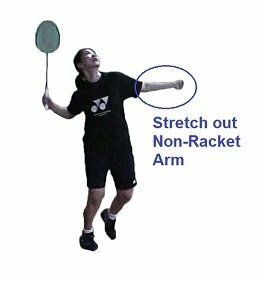 Non-racket Arm: I find this a common mistake among most people. Don’t forget to use your Non-Racket Arm for body balance. You should make it a habit! Besides balance, it’ll make your smash look cool! Do not smash every time! Another common mistake. Maybe because most people think that the badminton smash is the ‘coolest’ shot.Always remember the objectives of a smash…Apart from that, smash ONLY when you arrive quickly at the shuttle. There’s no point smashing if you can’t get into position in time.A badminton smash is like a double edged sword, it’s difficult for your opponent to defend it. BUT if your opponent manages to defend it, you may need to regain your balance quickly to be able to retrieve the returned shot. Professional players play a variety of shots like clears and drop; Not just the smash. Be patient and WAIT for your chance. Want to win like a pro? Then learn to play like a pro!